Used equipment experts to be on hand at International Plastics Exhibition’s booth # 2007. 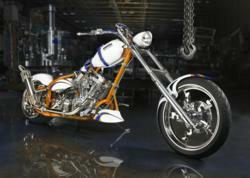 The "Aaron Bike" created by Orange Count Chopper will be on display in Aaron's Booth #2007. If you’ve got an industrial plastics requirement, chances are we can fill it...We’ll be happy to come up with an affordable plastics equipment solution to meet your specific needs. When the 2012 NPE Show gets underway in Orlando, Florida this April 2, Aaron Equipment Company will be exhibiting in Booth # 2007 of the West Hall. Aaron Equipment experts will be on hand throughout the exhibition, which runs through April 5, to discuss their large inventory of used plastics equipment as well as their appraisal, liquidation and auction services. While speaking with Aaron Equipment reps, visitors are invited to check out the Orange County Chopper “Aaron Bike,” which will be on display throughout the four-day gala celebration. With more than 26 plastics categories and thousands of pieces of plastic equipment in its inventory, Aaron Equipment is one of these industry reshapers. The company carries good-quality, late model machinery, much of it in reconditioned-to-new condition so that plastics professionals save substantial money without sacrificing quality. Some of the more than two dozen industrial categories encompassed by Aaron Equipment’s extensive inventory include plastics blow molding, plastics continuous compounding, plastic dryers, plastic extruders, plastic mixing equipment, plastic pipe – profile extrusion lines, plastic recycling lines and plastic sheet extrusion lines. As a world leader in used processing equipment for the plastics industry, the Aaron Equipment’s service offerings to which Perna refers include appraisals, liquidations and auctions for both buyers and sellers of used plastics equipment. To learn more about the various sales and purchasing options of used plastics equipment Aaron Equipment Company offers, visit http://www.aaronequipment.com/. For more information on the professional services Aaron Equipment extends to the plastics industry and to speak with an Aaron expert, drop by Booth #2007 at the 2012 NPE Show.